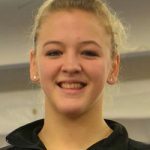 The career of this 17-year-old, very talented gymnast from Warren Center, Pa., Lauren Beers, was almost over. In 2006, Lauren was diagnosed with a disease called “Osteochondritis dissecans” (OCD) in both her elbows. OCD is common to young gymnasts and overhand athletes, particularly baseball pitchers. These sports can strain the immature surface of the outer part of the elbow joint. The bone under the joint surface weakens and becomes injured, which damages the blood vessels going to the bone. Without blood flow, the small section of bone dies. “I have been to four different doctors and all of them said that I have to quit gymnastics because of the disease,” Lauren says. But then she met Dr. Hill Hastings, a hand and shoulder specialist from Indianapolis, who is a medical consultant for the USA Gymnastics national team. She underwent four elbow surgeries, two surgeries in 2006 and two surgeries in 2011, which helped her to continue with her gymnastics career. “It was a very stressful time,” Lauren remembers. From time to time, her elbows have to be cleaned out, but she is able to continue with gymnastics. And Lauren has big plans: After graduation from high school this year, she will join the University of Alabama women’s gymnastics team. Lauren picked one of the best college teams of the country: Alabama is the reigning NCAA Women’s Gymnastics champion. In Tuscaloosa, she will be double majoring in physical education and special education. Lauren qualified for the Nastia Liukin Cup at the Parkettes Invitational in Allentown, Pa., where she won the all-around with a 38.525 total. The Nastia Liukin Cup final this year will be a special event for her, having qualified for the event in 2009, but suffering a torn anterior cruciate ligament during the warm-up.